Making leaders of men at the University of California, Irvine since 1986. First and foremost, we are a group of friends: a group of friends who live together, eat together, work together, and hang out together. We are men who seek to enhance our college experience, complimenting our academic pursuits by providing a fun and supportive environment that allows us to thoroughly enjoy everything that the University of California, Irvine and the surrounding community colleges have to offer. We are one of the older fraternities on the UC Irvine campus and have a long chapter history of brotherhood and success. Our brothers benefit from being in an organization in which we offer each other academic and emotional support. We learn how an organization functions and how it takes every man pulling his weight to make it operate smoothly. We are the leaders of Jewish life on campus, and we encourage each other to try new things, and to be spontaneous. Whether it be going to the gym to workout or play sports together, going to see a movie or a ballgame together, doing homework together, or even just lending a helping hand to one another, we are always there for each other. 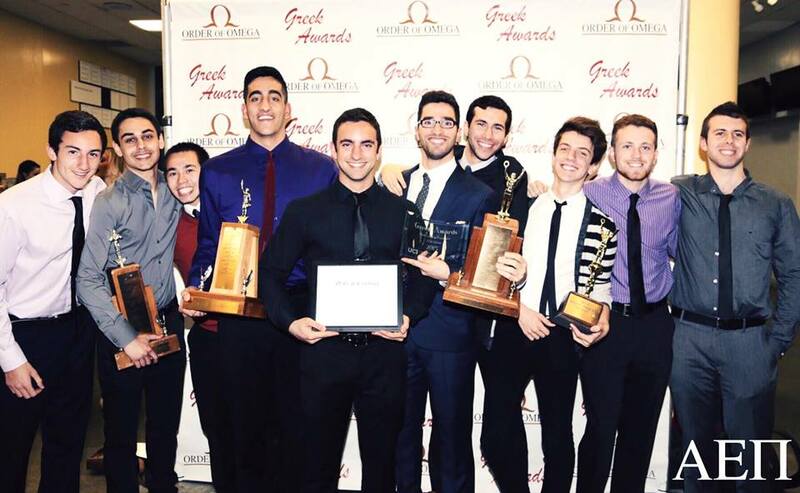 We are consistently ranked at the top of all UCI Greek organizations in GPA and have been honored for our scholastic achievement by the Office for Fraternity and Sorority Life. Our chapter encourages high academic achievement by giving all of our members the tools necessary to succeed. We maintain a chapter library which can give members information that they need to study in many different areas, and also ensures that there is always a quiet area in the house for people to study. In Alpha Epsilon Pi, we place a strong emphasis on being well-rounded participants in all aspects of student life at UCI. AEPi brothers participate in a variety of UCI student organizations, and hold numerous leadership and executive board positions in many of the groups. Philanthropy is often forgotten among fraternities, but not in Alpha Epsilon Pi. We pride ourselves on our dedication to the community and to the principles of Tzedaka and good deeds. Our chapter promotes member involvement in the local community by participating in community service and philanthropic projects to help support and benefit Irvine and the local area. Our heritage stems from one source: young Jewish men banding together in allegiance. The role of Alpha Epsilon Pi has expanded since its inception in 1913. Initially, the Jewish fraternity served as a brotherhood of young men who came from similar religious backgrounds and who had experienced the same prejudices against their religious beliefs. Alpha Epsilon Pi soon broadened its role to include serving as the living quarters for some of its members. The fraternity became a home away from home, providing the same stabilizing and guiding values that students previously gained from their families. Armed with these values, Alpha Epsilon Pi faced changing conditions on the college campus and survived. Today, Jewish students search out Alpha Epsilon Pi because it is a Jewish Fraternity. In the fraternity’s 98-year history, over 93,000 men have worn the badge of Alpha Epsilon Pi and each year, over 2,500 undergraduates perform the Ritual of Initiation, which remains the same ritual adopted decades ago. Perhaps of greater importance, Alpha Epsilon Pi develops leadership for the future of the American Jewish community. Tomorrow’s Jewish leaders are in our chapters today. These are the young men who must be counted upon to support Jewish causes and to prepare to be one of tomorrow’s Jewish leaders, so that they may aid themselves, their family, their community, and their people. Those students who enter the mainstream of non-Jewish life on the campus are far more likely to assimilate and to forsake their heritage. Working together with the Foundation for Jewish Campus Life/International Hillel, Alpha Epsilon Pi can play a vital role in helping reverse the growing trend among our young people to abandon Judaism at this critical time. Throughout our history, the fraternity setting has served as a “learning laboratory”, a testing ground for young men who later become leaders in business, education, government, religion, and science. A goal of our fraternity is to help each student to develop character, to learn responsibility, and to develop a proper set of values through living together in brotherhood. Alpha Epsilon Pi prepares young men for their role in life as responsible citizens.